I’m just returning to work after two weeks of vacation. And what a two weeks! Long, lazy summer days filled with whatever I chose to fill those days with has been healing and rejuvenating. This year, I had been holding out for this sacred time away after a particularly stressful year–the kind of year that left me feeling like I didn’t do a great job at anything—being pulled in too many directions, scattered, and spent. It was a year of survival. Mere survival is just not okay with me. I want to thrive in this life and in my work. I aim to be present, deliberate, and reflective. I want to have fun! Determined (and desperate) to have a different kind of year, I’ve spent a good amount of time on my vacation contemplating self-care. I find it frustrating that I’m still struggling with how to effectively care for myself since this is an issue about which I’ve long theorized and practiced in order to be present for myself and others. Nevertheless, despite all my best and true intentions here I am—yet again—faced with the challenge of how to do it differently. How do I care for myself better, particularly in the face of immense stress? I know self-care to be a political act, not solely about caring for myself but about caring for my relationships, my organization, my community. 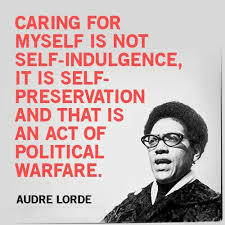 As Audre Lorde so beautifully put it, “Caring for myself is not self-indulgence, it is self-preservation and that is an act of political warfare.” If I cannot be healthy and well, my attempts at fostering healthy relationships and spaces are severely compromised. Therefore, as a feminist leader in Student Affairs, I know how fundamental self-care is to my work. Feminist leadership seeks to make power visible in order to create positive change. In order to do this, the practice of feminist leadership must attend to all dimensions in which power operates: the public (where power is visible such as the government, military, corporations), private (within institutions, families, relationships), and the intimate (the powerfulness—or powerlessness we feel within ourselves in the form of self-confidence, power over our bodies). Therefore, feminist leadership calls for self-awareness and self-love as critical to prevent narcissism from driving all actions and to ensure that true otherness can be recognized and respected. In other words, we gotta love ourselves before we can love anyone else. Practicing feminist leadership and self-care in Student Affairs requires an ability to create and sustain healthy boundaries with relationships and with work/life. Given the value our work places on relationships (with students, collaborating partners) and non-traditional work schedules, the boundaries that help to protect the self are often tested in complicated and messy ways. It can be tough, for a number of reasons, to tend to our own needs in the culture of Student Affairs. And this is precisely what makes self-care so vital to our work as feminists in Student Affairs. I have no answers to my desperate question of how to practice better self-care this time around. However, I believe that the answer lies in the continuous asking of this important question. After all, the answers inevitably change depending on our evolving selves and circumstances but the question itself both demonstrates and fosters the self-awareness and self-love that we seek. Thanks, Jane! I’m sure you have plenty to share from your long-time experience practicing feminist leadership with this topic! Would love for you to contribute a post! You are a deep and critical thinker, Amy. Thank you for making the point that self-care is not selfish, but self-preservation. All women need to think about this. Your post is inspiring and it motivates every woman who believes on survival. Survival is to succeed in life and work, self-motivated, deliberate, and effective as necessary. Anyone would possibly agree as Audre Lorde acclaimed that, to care for own self is not self-indulgence; it is self-preservation and an act of political warfare. When I shared your blog to my mother she also agreed in everything you said. According to my mother, if a woman takes good care of herself is a sign of protection instinct that every woman has. It is just a matter of courage to act the way a woman should. Through my observation, most feminist leaders seek positive changes; it has the self-awareness and self-love, for recognition and respect. The things you practiced surely attend all the dimensions mentioned on feminist leadership. The power that would result directly applied to the public; visible to all the people especially in the government, armed forces, and businesses. It would also operate in the private level; to families, relationships, and institutions. Lastly, it operates to the intimate level; in the form of self-confidence. The way you presented your post, you help women understand the essence of being a feminist leader and also other people including men. To love own self is easier to love others. The ethics of care help developed an alternative to the dominant moral theories; it changed the ways moral problems, interpreted and approaches recommended to moral issues. The ethics of care highly offered hope of rethinking in more fruitful ways to guide own self (Jahannesen, Valde, & Whedbee, 2008). Just continue on your journey as a feminist leader to be best in your life and relationship with others at work. I commend you of being a strong woman that exemplifies power. (6th Edition ed.). Long Grove, IL: Waveland Press Inc. Thank you so much for sharing your thoughts on this, and for your support and encouragement.